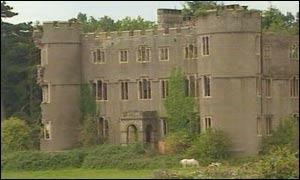 Ruperra Castle was the second home of the Morgan family in south Wales. From the early 19th century the heir to Tredegar would usually live at Ruperra. A terrible fire in December 1941 (the third such conflagration to hit the castle in its history) gutted the place, and it is now a 'romantic ruin' with an uncertain future. A new book 'Serving Under Ruperra: A Collection of Memories' has just been released. The book has been compiled by 'Pat Moseley and members from the Rudry Local History Group from conversations with local people and their friends and relations in the 1980s and 90s and from material donated by them'. Anybody wishing to obtain a copy should find information via the Ruperra link to the right of this website.